Al Davis had plenty of respect within the NFL power structure, as we learned this weekend. Those of us who knew him only as a craggy-faced Jamarcus-loving iconoclast now know of him as something better than that, a powerfully transformative figure. But he still had enemies. Among them: onetime Raiders head coach—now Redskins head coach—Mike Shanahan. It was 1994 and Shanahan and Grbac were both with the San Francisco 49ers. Shanahan, the offensive coordinator, was working with Grbac before a game against Oakland. 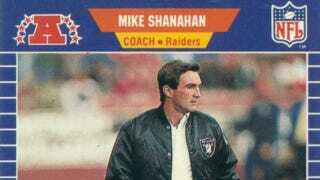 Shanahan had spent just over one season as coach of the Raiders before being dismissed by the owner, Al Davis. The breakup was bitter, and the two men despised each other, mainly because of a dispute over back pay. So Grbac did. He threw a tight, hard spiral some 30 yards directly at the head of Davis. At the last second, Davis saw it and ducked, the ball missing him by only a few inches. Davis, his hair ruffled, then made an obscene gesture at Shanahan, witnessed by a former Raiders coach who confirmed Grbac's story. We only hope that someday Shanahan will have occasion to order a beanball at his current employer.